You fight real, deadly battles on a small scale in these fascinating war games, which have all the strategic elements of nation-against-nation campaign. Exploding battleships, forts and tanks and an accurate long – range mortar compose your fighting forces, built as described in this article. MANY of us have been fascinated by photographs or moving pictures of huge artillery pieces sending their shells screaming up into the air on their way toward a target perhaps out of sight beyond the horizon. The gunners usually do not see the target, but fire in a certain direction and at a certain elevation from data furnished to them. The toy mortar shown in the photographs and drawings will shoot small soft clay balls in the same manner as the big guns and with surprising accuracy. It can be used as the basis of some interesting games that will attract many of the older folks in addition to the youngsters. Easily constructed targets which explode (mechanically speaking) when hit, a moving target and others are also part of the equipment described. The construction of the mortar is shown in Fig. 2 and the photographs. It will be noted that rubber bands and the old catapult principle are used. The tension of the rubber bands can be varied depending on the amount of space available for the games. The maximum range may be varied from a few feet to over 20 feet. The elevation pointer, the barrel, and the large washers are made of sheet tin. The barrel has no function except to add to the appearance. The catapult arm should be made of fairly hard wood. The hole in the arm which receives the shot is triangular in order to insure uniform and firm seating of the clay balls. The base has three points for contact with the table or floor to prevent tilting, or a thin board may be fastened to it and weighted down with books to prevent any shifting of position. The deflection and elevation scales are easily made by drawing with India ink on white lacquer and covering with a coating of thin shellac. The clamp which holds the elevation is important because the “recoil” of firing would otherwise change the angle. The shot are made from the type of modeling clay that does not dry out. The balls may be made in any size, but 3/8″ diameter is about right. Fig. 2 shows equipment for making the shot uniform in size. The mortar is the main idea of the games and should be constructed to fire as accurately as possible. At a range of 12 to 15 feet, most of the shots should fall in a 2 or 3-inch circle. The mortar is intended to be used at angles over 45 degrees. This makes it possible to fire at targets disposed horizontally and does not require high velocities which would be rather dangerous to use indoors. The “explosive” targets, which fly to pieces when hit, are shown in Figs. 4 and 7, and the photographs. The construction can be easily understood from the photo, Fig. 3. They “explode” when a shot strikes from above and causes them to bend down slightly at the canvas hinge. The rubber band snaps the two sides up into a “V” shape throwing the turrets, fort, cannon, etc., into the air. The sensitivity of the exploding mechanism may be adjusted by changing the angle which the two sides make at the hinge. Leather, cloth or canvas may be used for the hinge. The bottoms of the battleships are smoothed so they may be pulled over the carpet or floor if desired by the small clock works tractor to be described below. The parts of the ship and fort are not fastened together except where indicated, in order that they may fly to pieces when struck by a shell. The moving target is shown in Fig. 7 and the photographs. It is a small clock works-driven tractor and may be used as the driving mechanism of a tank, as a target itself, or for towing battleship targets. The construction is simple. The clock works is held in place by pressure of the parts above and below it. The rubber band around the driving wheel increases its traction on the carpet or floor. A single wheel is used in front in order to keep all wheels on the floor at once. The screweye is the simplest means for keeping the rubber band belt in place. The stopping device is shown in Fig. 7. Note that a loop of wire is held against one of the clock wheels by a small rubber band. Pressure on the end of this wire, which extends through the top of the tractor, disengages it from the wheel and the tractor starts. When the deck is struck by a shot it flies up into the air, the wire comes up, and the tractor stops. The tractor should move rather slowly. About 1/2 to 1 inch per second is a good speed. This can be adjusted or changed by varying the size of the wheel on the minute hand shaft. It will also be found that oiling the smallest wheel in the clock, (usually the escapement wheel) increases the speed a great deal. A tank may be made of cardboard as shown in Fig. 7, and the photographs. The top opening should be made to rest on the corners of the top of the tractor. A small turret, as shown, can be made to rest on the top of the tank over the explosive deck of the tractor. Thus when a direct hit is made on the turret of the moving tank, the turret flies up into the air along with the tractor deck and the tank stops. If the “explosive” targets described above are not desired, less complicated ones are easily made from cardboard or tin in the shapes shown in Fig. 8. Make the bottoms of heavy wood or pad with cloth to prevent the balls from bouncing out. There are many kinds and variations of games that can be devised for the mortar and targets. The simplest would be a contest for accurate shooting. A good way to conduct such a contest is to move the target after every 3rd or 4th shot, or have a number of targets and allow 3 or 4 shots at each. If a box target is used, the total hits can be counted and if an explosive target is used, count the shots required to explode it. Since the mortar does not always duplicate its shots, depending on the care used in making the balls, loading and firing, a contest using 10 to 20 shots from one position could also be tried. These are only a few suggestions; many other contests can be readily devised. 1. Coast Artillery. Locate the mortar on the floor, table, or a chair. Place one or more battleships or box targets just beyond the extreme range of the mortar. Move the targets toward the mortar zig-zagging if desired, about 4 to 8 inches at a move. The mortar is allowed 2 to 4 shots per move. The ships win if over half of them reach some designated point. An interesting variation is to lay out a map and prepare data as shown in Fig. 1. Still another variation is to have the mortar located where its gunner cannot see the ships, the firing being directed by an observer. Or a whole area may be laid out and data prepared as in Fig. 5. The observer then reports only the location of the ship and the gunner uses the data for pointing his mortar. Moving Targets. Couple two or more ships (as many as can be pulled) to the tractor and fire at them as they are drawn past an open doorway or between two marks on the floor. Allow unlimited firing or allow some definite number of shots, perhaps about 10 or 15 depending on the range, speed, etc. The tank can be used as a moving target in a similar manner. Artillery Duel. Many interesting contests can be arranged if two mortars are constructed. The general rules for such contests are as follows: Locate the mortars on the floor or on tables about 10 to 12 feet apart. Mark off an area in front of each about 3 by 5 feet. Place forts and ships in this area an equal number on each side. At a signal each side begins to fire. The contest ends when all forts and ships on one side are destroyed. This game may be varied by allowing three shots at a time on each side and then moving the ships to any new location in the marked off area. Then another three shots are allowed until one side is destroyed. This game may also be played by having an observer on each side and low screens provided as in Fig. 1 to hide the targets from the gunner. 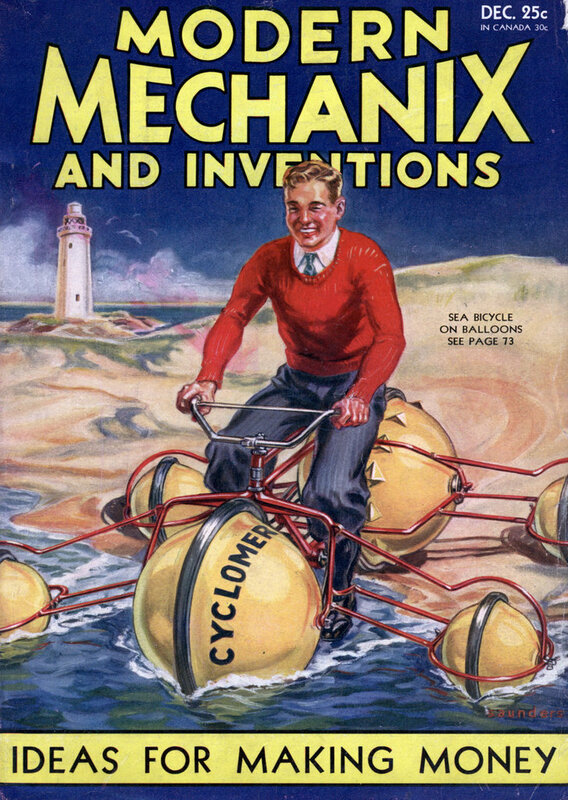 This looks more like “MAD” than Modern Mechanix! A nice keyhole look at the mindset of the 30’ies. Look at it, think about it, and then think again how things like WWII could happen in a time where military and waging war was “cool”… then look at today, and be afraid. Doesn’t the game on page 1 look like a giant, floor-sized version of Battleship? This is very intersting and would like to obtaine a copy of these pages for my personnel files. John Curry: Sure, feel free. 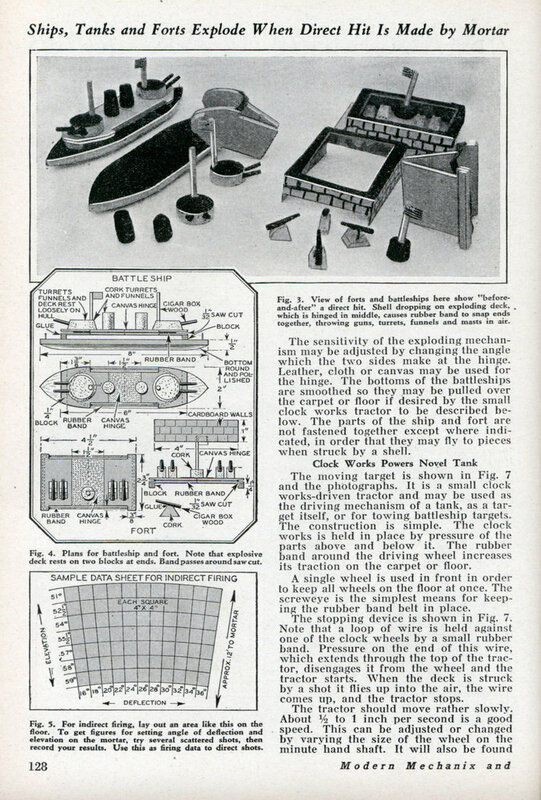 Crossbows and Catapults, 1930’s style! The fight Artillery Dules is a great game to make. Do you have more like large wooden soldiers to fire at?